Ancient – Zhujiajiao Town was formed 1,700 years ago. The town was officially established during the Ming Dynasty. 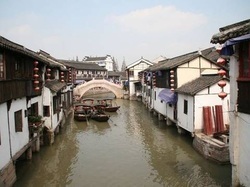 Zhujiajiao covers a total of 138 square kilometers, including an ancient town area of 2.7 sq. kms. There are archaeological findings of 5,000 years ago of the lives of the primitives. Prosperous – The town became prosperous with the cloth and rice business. There are still the remnants of the historical sites, such as the post office of the Qing Dynasty, the old rice and oil stores, old banks, a power plant and ancient properties. On the river – There are numerous rivers crisscrossing the town. Nine long streets run along the rivers; thousands of ancient buildings stand on the banks. Thirty-six ancient stone bridges constitute a picture of ancient town life. Pureland from hustle and bustle – Take a walk on a moonlit night or under drizzling rain on the little slab-stone paths to explore the ancient times. Those were the stone paths on which the scholars trod on their way back with success at the Imperial Examination. Imagine you are in that picture. Is it enchanting? Located on the banks of Dianshan Lake in the western suburbs of Shanghai, Zhujiajiao is about 50 kilometers away from the city center. Qibao is a town in the Minhang District, southwest of Shanghai proper. Pronounced Qi'bao, it is literally translated as Seven Treasures. Its formation can be traced back to the Northern Song Dynasty, some a thousand years ago. The name comes from the local temple, "Qibao Temple," which is no longer in existence. Qibao Old Street is actually made up of a number of streets criss-crossing two blocks and bisected by a canal. Traditional Ming and Qing Dynasty buildings have been refurbished and offer museums, gardens, shops, restaurants and tea houses. Visitors can take boat rides from the tiny wharf along the canal. Boats run daily from 8:30am to 4:00pm and lovely ride takes around 20 minutes (RMB 10 per person). Notably, Qibao town is known for cricket, it’s a local specialty. It is said that the Qibao production of the cricket's bravery and aggressiveness, are of top grade.